Come sail with us on the beautiful and scenic St. Clair River aboard the Duc d'Orleans II. A family owned business for over 30 years we offer a narrated lunch cruise from Monday - Saturday pointing out areas of interest and a bit of history, reservations required. We also offer a "cruise only" on Sundays..a perfect way to spend a sunny afternoon. 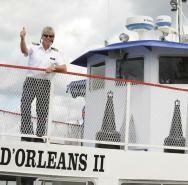 Cast off with us under the watchful eye of the Captain and his crew aboard the Duc d'Orleans II!